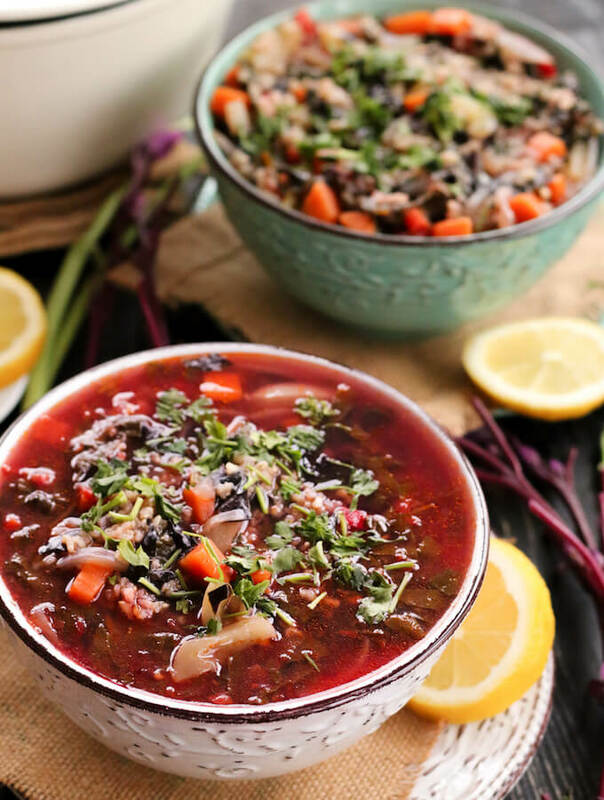 Ciorba de loboda si Stevie — A deliciously hearty Romanian sour soup made with purple spinach, rice, and lots of vegetables. The sour taste comes from adding stevie leaves, another exotic Romanian leafy green vegetable, and lemon juice. I love spring! The local vegetable market is full of fresh mountain vegetables. There are vendors selling all kinds of leaves on the street. And the one leaf that has my attention since long is loboda – a bright purple colored leaf. 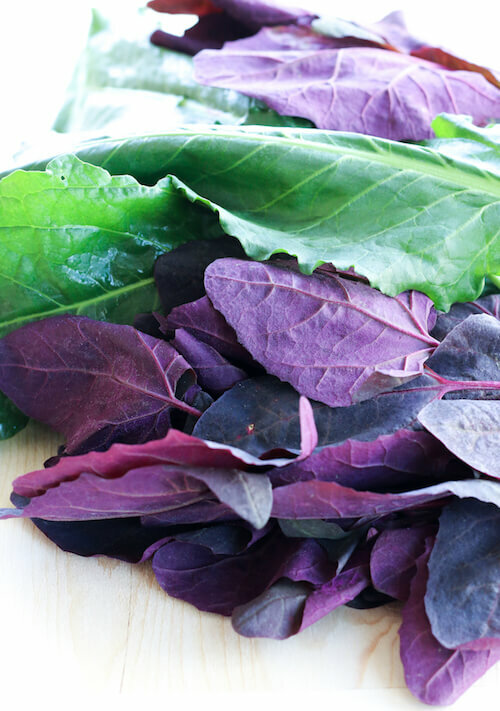 In English loboda is called orach or purple spinach (also called mountain spinach). The leaves are a beautiful combination of red and green color. I just had to buy them and cook with them. So I turned to my friend’s mom and asked for loboda recipes. She was the one what had earlier taught me the White bean Romanian soup recipe. “Ciorba de loboda si stevie!” was the answer I got. Ciorba is Romanian for soup and more specifically used for sour soups. The loboda leaves that are quite common this time around are wonderful in soups and salads. I love the deep purple color they give to the broth. To give more body to the soup, short grain rice is added along with the soup vegetables like onions, carrots, and peppers. You can also add potatoes. The soup is made sour by adding lemon juice or Borș. Borș is fermented wheat liquid that is used as the souring ingredient in Romanian soups. In this soup recipe, Loboda is paired with sour stevie leaves, another seasonal Romanian leafy green vegetable. I love exploring and learning new recipes. Traditional Romanian cuisine is very meat based but there are vegetarian dishes like these Romanian soup recipes that are absolutely a must try! If you like this recipe, please take a moment to rate it and/or leave your comments at the end of the blog. It will really encourage me to keep exploring, learning and improving. 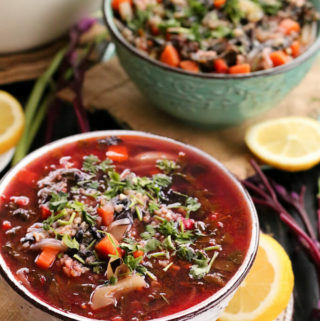 Ciorba de loboda si stevie — This popular Romanian soup is made with deep purple loboda leaves (called purple spinach in English) and sour stevie leaves. With rice and other soup vegetables, it is a delicious, healthy, and hearty meal. The same soup recipe can be made with normal spinach leaves as well. Heat oil in a deep stock pot. Once the oil is hot, add garlic. Sauté for a minute. Add onions, carrots and peppers. Mix well and cook for 5 mins. Drain the soaked rice and add to the soup vegetables. Add salt, pepper and stock. Mix well and cook covered for about 15 mins till the rice is soft and cooked. Add the loboda and stevie leaves. Cook for another 5 mins. *Cut out the thick middle vein of stevie leaf. Only use the soft leafy part. While it is a popular Romanian soup made during spring when these leaves are in season, the same recipe can be made with normal spinach to make a clear spinach soup. 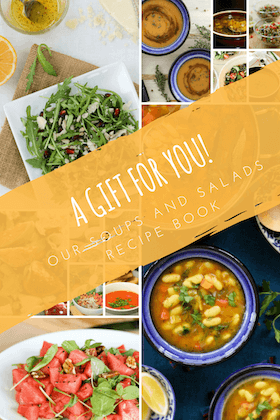 For more delicious soup recipes, download my free Soups and Salads ebook with 14 healthy, easy-to-cook, delicious recipes. In April and May, there are lots of fresh leafy green vegetables — loboda (mountain spinach), stevie (yellow dock green), leurda (mountain garlic), and urzici (nettle). Nettle leaves are common in hills in India too and we often make tea with dried nettle leaves but now I have them all fresh! I am so excited to discover all these wonderful greens. Do you have any traditional recipes with these leaves to share? Would love to start a conversation, share recipes, cooking experiences and food stories from around the world.